Does This Gene Make You Look Fat? University of Arkansas researchers found a way to use fat development in fruit flies to help understand fat metabolism in other animals, including humans. They have developed a genetic model to study a protein that regulates fat production and storage in fruit flies. This protein, which has counterparts in humans, will help researchers better understand the complex regulation of fat production and metabolism at the molecular level. The researchers focused on lipin, a protein involved in fat and energy metabolism. Three different lipins regulate metabolism in humans and mice, and the interaction of these three proteins complicates metabolic studies in mammals. However, fruit flies have only one lipin gene. This makes them an ideal model for basic studies that can be conducted in flies with less cost and more speed than in mice. When the researchers studied fruit fly larvae that carried a mutation in the lipin gene, they found that the animals looked like liposuction had been performed on them. The larvae barely had any fat deposits and the skinny animals quickly died after entering the stage of metamorphosis. 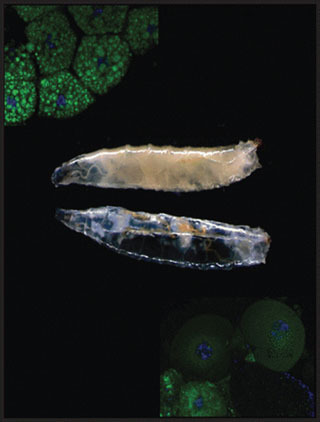 While humans don’t go through metamorphosis, fat still serves a purpose. Fruit fly (Drosophila melanogaster) larvae that do not express sufficient amounts of the protein Lipin look transparent due to a lack of fat (bottom larva). Normally, the body cavity is filled with white fat tissue (top larva). Image courtesy of the American Society for Microbiology.